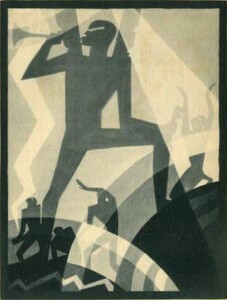 When did I first see an Aaron Douglas painting? I can't recall exactly, but it must have been in the first couple years of my undergraduate studies. It seems his work has been with me for a while. I keep going back to how he effectively created a sense of deep space while using hard edged shapes throughout an entire image. The layering in his work has always reminded me of the sets that are used to create a sense of place in the theater. The way that he created depth in his paintings has informed how I do it in my work, as well as how I approach the subject with the classes that I teach. His work has served as inspiration for both my elementary school and college classes. In his symbolic paintings of African American history he created depth by changing the size, value, and vertical placement of the layers of shapes that were present in the images. In years past, students have made collages based on Aaron's work, and these are more true to his visual style. This year, however, the students used watercolors to create a landscape that had a fore, middle, and background. To keep the shapes clear, since they were doing the project all in one class, students outlined the shapes with sharpie marker. We also discussed analogous colors, so students chose one of those color families to paint their landscape. The darkest of the 3 was used in the front, and the lightest of the 3 was used in the back. The setting and details included in their landscape was up to the students, I offered suggestions and had various examples posted for them to refer to.